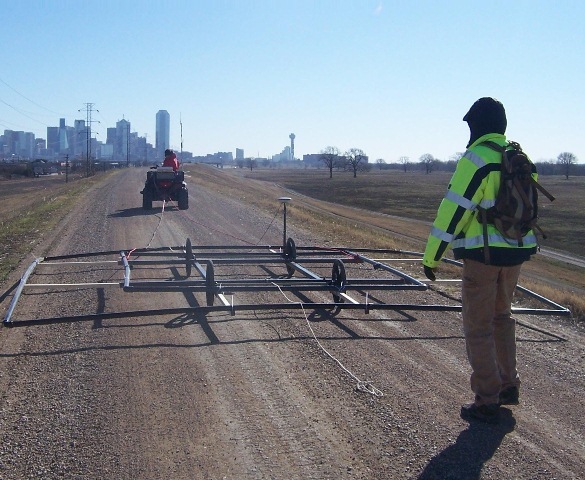 More than four miles of the Trinity River Levee near Dallas, Texas were surveyed using MASW and DNT™ techniques in a single day due to the use of mobile and rapid-deployment equipment. 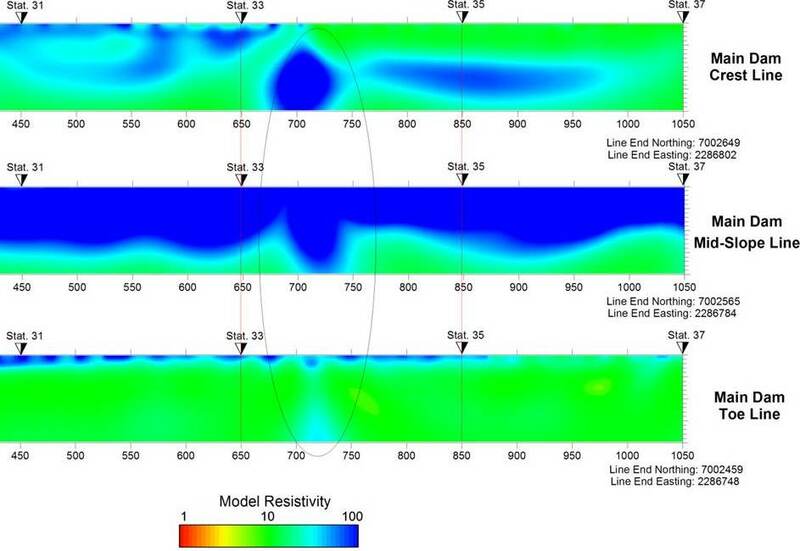 The multi-channel analysis of surface waves (MASW) seismic method was chosen to determine any at-risk soft spots. MASW data was acquired using a land streamer of geophones that could be quickly laid out behind a vehicle, reducing set-up time. 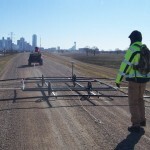 The Zonge Dynamic NanoTEM™ (DNT) mobile transceiver and a towed five-meter loop were used to collect resistivity data. Results clearly revealed a conductive anomaly indicating seepage. 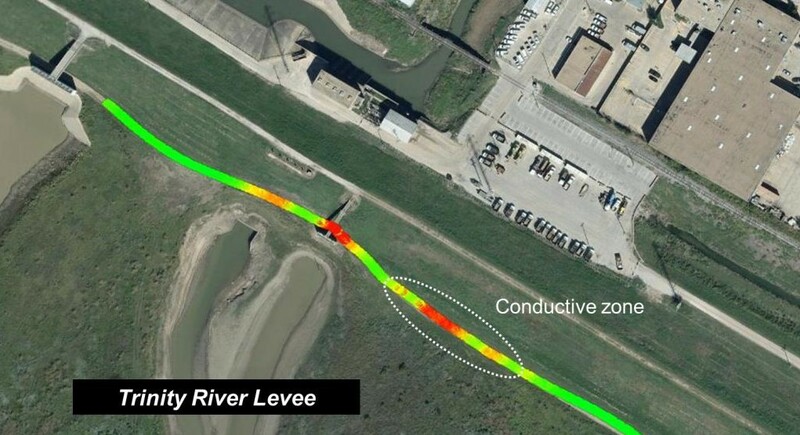 Zonge contributed interpreted geophysical data to a comprehensive geotechnical review of Eagle Mountain Dam and Spillway Levee, two separate, earthen structures north of Lake Worth, Texas maintained by the Tarrant Regional Water District. 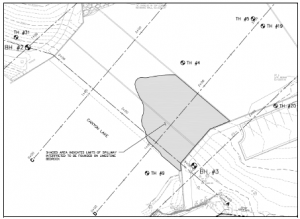 A combination of methods was used for determining depth below the dam crest and the position and limits of known sheet-piling to guide remediation drilling activities. The Zonge project manager for this challenging job created a solution for overcoming logistical constraints and background noise from fast-moving water to use MASW as a shallow-marine technique on a concrete spillway near Rapid City, South Dakota. 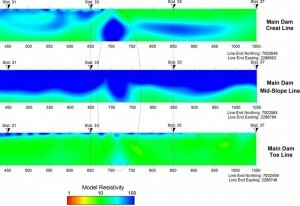 The survey goal was to provide information between dam pre-construction boreholes, and generate a 2D cross-section profile showing depth to bedrock beneath the structure. Ultimately this data would be used to determine remedial solutions to mitigate ever-worsening seepage and to extend the life of the structure. 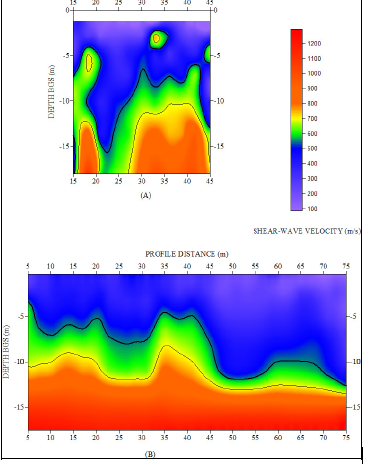 Multi-channel analysis of surface waves (MASW) is an “active” seismic technique meaning it requires a hammer blow or mechanical weight drop to generate dispersive waves that travel along the surface of the earth. The energy is measured by several sensors to find the phase velocity vs. frequency of the waves. In the Trinity Levee survey, multiple soundings were collected along a line using equally-spaced geophones to map the lateral as well as vertical profile. For the Canyon Lake Dam survey, by using several different source-receiver array configurations and integrating the data during processing, a better, deeper 2D profile than what a standard single array configuration would have produced could be created for this site. And the inclusion of more data points increased redundancy and confidence in the modeled results.